I am not a health care professional so what I have to write about today is not based on anything but experience. For detailed information you'll have to google it. What I am talking about is Apple Cider Vinegar. It has to be the raw, organic, unfiltered vinegar with the "mother". The “mother” is made up living nutrients and bacteria that you can actually see as they settle in the bottom of the bottle like sediment. The “mother” is believed to have anti-bacterial and anti-fungal properties. ACV, the acronym for Apple Cider Vinegar, is a very helpful addition to my health and the health of my family. It has many benefits especially when mixed with natural honey. My husband had acid reflux and the doctor put him on acid blocker medication. This medication shut down some of the acid receptors in the stomach and supposedly lowered the amount of stomach acid. I suggested he start taking two teaspoons of ACV and one teaspoon of honey in a glass of water. He did it morning and night. In a couple days, he quit his medication and hasn't needed it since. Even though ACV is acidic, it becomes alkaline in the stomach. I had been taking it for a while because I read of all it's fantastic benefits (google that too), but I didn't have such dramatic results. I can say that after Christmas my grandchildren all had colds and the stomach flu. Of course, they coughed right in my face and kissed me. I was feeling a little sick to my stomach one night and took a generous swig of vinegar and honey. It settled my stomach almost immediately. Soon after beginning the regiment, I began giving it to my dad. He is 88 and drinks it before bed. He claims it helps him have a good night sleep. Who knew. The goodness of this product may be in our heads, but as my mother used to say "if it's all in your head, then maybe that's where you need the help". 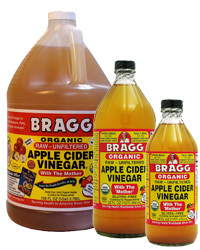 I have purchased this Bragg brand and also the Vitacost brand.